There are many fabulous waterfalls (over 100) and swimming holes all along the Kangamagus Highway and Swift River in New Hampshire’s White Mountains. Several are conveniently located on or very near the White Mountains National Forest mountain bike trails we feature. Lower Ammonoosuc Falls : Height: 30 ft. 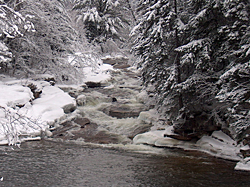 The Ammonoosuc River drops about 30 ft. in a series of steps, framed by granite banks and trees on both sides. The swimming hole at the bottom of these very picturesque falls is popular during the summer months. From Rt.302 turn onto Old Cherry Mountain Rd. 3 miles east of Twin Mountain. From the parking area head down the old abandoned road to the falls. Upper Ammonoosuc Falls : Height: 8 ft.
A series of rapids on the Ammonoosuc River approach the falls, then the river plunges into a narrow pool below. Short drops eventually lead to larger pools. Visit early, or late in the day to avoid summer crowds at this beautiful spot. Pretty to look at, but deadly. Use extreme caution as the falls are notoriously hazardous to swimmers due to strong whirlpool currents at the base of the falls. From Rt.302 at Fabian, turn north on the base road to the Cog Railroad. After around 2.3 miles park on the right side of the road where there is a short trail leading to a footbridge over the falls. Franconia Falls : Height - 30 ft. The trailhead for the popular family-friendly Lincoln Woods Trail is off the Kancamagus Highway, a designated scenic byway, 5.7 miles east of Lincoln. At the end of the 2.8 mile trail, the Franconia Falls Trail follows Lincoln Brook to the falls. Biking is not permitted on this short trail but, a bike rack is provided during the summer. The falls flow over a granite ledge in a series of cascades and slides. While you are in the area, don't miss Franconia Notch State Park located just north of Lincoln off I-93. It features spectacular scenery and interesting geologic formations. A 2 mile paved loop trail takes you to waterfalls, covered bridges, glacial boulders, the Flume Gorge, and one of the deepest pools below a waterfall around. Highlights include Table Rock, 40 ft. high Avalanche Falls, 70 ft. high Liberty Gorge Cascade and ‘The Pool’ a deep basin in the Pemigewasset River. Swiftwater Falls : Height - 12 ft. 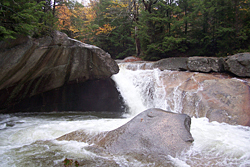 The Wild Ammonoosuc River cascades over several bedrock shelves into a deep, large pool. 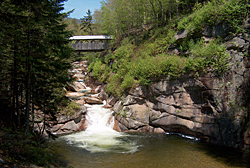 It is a popular swimming hole during the summer and a great place to cool off after your bike ride on the rough and tumble Ammonoosuc Rail Trail. An added attraction is the Swiftwater Covered Bridge just above the falls. If you are looking for adventure, a bike trip in and around the Carrabassett River Valley should be on your list. The Carrabassett River Trail, Sugarloaf Bike Park and the Main Huts & Trails System and more are located at the base of the second highest peak in Maine. 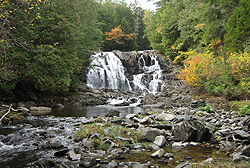 The trailhead to these 2 beautiful waterfalls is located at the Maine Huts & Trails Gauge Rd. Trailhead in Carrabassett Valley. During the spring, summer and fall the MH&T 5.9 mile trail network is available for hiking and mountain biking. South Brook fall drops 24 feet; Poplar Stream Falls plunges a far more impressive 51 feet. Beautiful Hadlock Brook Falls is a destination at Acadia National Park that most visitors to the park miss. The falls are located on Hadlock Brook above Upper Hadlock Pond. It is the highest cascade in the National Park. 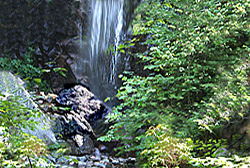 Hadlock Brook Falls : Height - 40 ft.
Park at one of the 2 lots along Rt. 3/198, north of the town of Northeast Harbor. Take the carriage road leading to Upper Hadlock Pond and the waterfall (refer to the NPS Carriage Road Trail Map - markers 12, 13, 18 and 19). It’s a 3.9 mile bike ride with some steep grades. 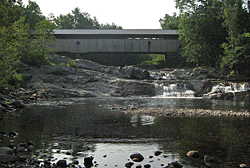 The path leads to Hadlock Falls, travels over 3 stone bridges (Hadlock Brook Bridge, the Hemlock Bridge and the Waterfall Bridge) and travels along the fringe of Upper Hadlock Pond before the route loops back to your starting point. There are super nice views of the falls from the Waterfall Bridge. There is a roadside rest area at "The Falls" on Rt.201, just before it enters Canada. This series of drops along Sandy Stream can be seen from the road. They may not be the most impressive falls, but access can’t be easier. Restrooms and picnic tables are available at this pleasant stop. Heald Stream Falls: Height: 18 ft. Very few people visit these remote falls near the Canadian border. Seen from a bridge or its base, the falls cascade over steps into several pools. Watch for Moose in the area. The falls are in logging territory, 1/2 mile further up Rt. 201 from “The Falls”. A dirt road leads to them. 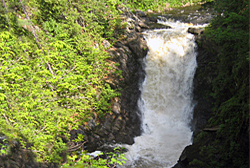 Moxie Falls: Height: 18 ft.
Moxie Stream plunges further than any falls in Maine. These scenic falls are accessed by a short hike from Rt. 201 near The Forks. Many of the visitors to the falls have been whitewater rafting on the Kennebec and Dead Rivers. Above and below the main plunge are other cascades and pools. The best swimming hole is 100 ft. downstream, but does require scrambling down some steep terrain. An easy 10 minute walk from Rt. 201 leads to Houston Brook Falls. They appear wild and rugged, plunging over jagged rocks to the shallow channel below. This is a good swimming hole, but easier to get to when the water level is low. Mist can make the rocks around the falls very slippery and dangerous. Just dowstream the brook runs into Wyman Lake, north of the Solon to Bingham Trailhead in Bingham. Big Falls: Height - 40 ft. This delightful bike ride takes cyclists on a 22-mile loop over gentle hills and through stream valleys in Vermont’s Northeast Kingdom. Along the route, cyclists are treated to jaw-dropping views of the 40-ft Big Falls on the Missisquoi River. Directions: Big Falls are located around 1.5 miles south of Rt.105 (North Troy) on River Road, There is an obvious unmarked parking area on the side of the road. The falls are about 200 feet from the parking area. 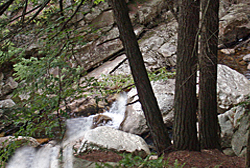 The Falls of Lana, on Sucker Brook, can be seen from the Silver Lake spur trail. It’s a challenging mountain bike ride requiring a steep descent on loose gravel and an even tougher climb back up. The falls are layered in four sections. White ribbons of water switchback through the rocks and cascade down through the gorge into deep pools on the way to Lake Dunmore.